Within India, the highest volume of GoT-related content on Instagram came from Mumbai, Delhi and Bangalore, followed by Hyderabad and Chennai. According to data collected by image and video sharing app Instagram, Indian fans have been losing their minds over the upcoming release of the final season of HBO's epic show Game of Thrones. Turns out that Indian fans are among the top five fans from across the world to be most excited about the season finale, preceded only by the US, Brazil and Great Britain. In fact, they are the most excited as far as countries within Asia are concerned. With the final season of Game of Thrones nearing release, the frenzy has reached an all-time high with anticipating fans around the world waiting with bated breath and chewed up fingernails for the epic series' much-speculated finale. Instagram went through GoT related data and content on the site and found that from discussion fan-theories, trivia and fit bits from the show to generally searching and sharing GoT content, Indians were a part of every GoT pie, ranking globally at number four in terms of fan frenzy. Trending GoT hashtags from the country on Instagram include #gameofthrones, #got, #jonsnow, #forthethrone, #aryastark, #sansastark, #winteriscoming, #daenerystargaryen, #tyrionlannister and #winterishere. 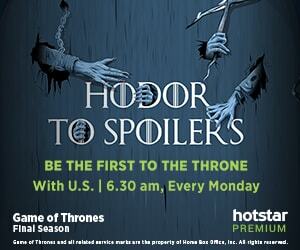 The most talked about and therefore deemed popular characters among Indian fans is, of course, Jon Snow. Other characters that Indian fans seem to love and admire include Daenerys Targaryen, Arya and Sansa Stark and Tyrion Lannister. Surprised to not find Cercei or Jamie Lannister on the list? Or even Bran and the White Walkers? It seems Jon Snow has trumped all others and there could be a good reason for that. Is it because of Snow's coming-back-from-the-dead plot twist in Season 6? Everyone who has spent any time in India would understand the nation's love for drama serials such as 'Kyunki Saas Bhi Kabhi Bahu Thi', 'Kasautii Zindagii Kay' and a myriad other Hindi television shows of the 90s and early 2000s. Almost each of them included story arcs that centred on killing off central characters, only to bring them back (sometimes as different actors altogether). Maybe that is why Jon Snow is popular among Indian fans? It reminds them of those happy times as a child when the world was a better place and dead heroes always came back. On April 14, the saga that began eight years ago on April 17, 2011, will finally pull to close and the world would finally know the fates of their beloved characters - Jon Snow, Daenerys Targaryen, the Starks, the Lannisters. They would also find what becomes of the Weirwood tree at Winterfell and the Iron Throne at King's Landing.